Chat (BottomLeft): Go over it and right click on "General" tab of the chat frame, click Unlock Window and drag the tab around until you have the frame in a position you like. Omen (MiddleLeft): Type "/omen config" (without quotes) and uncheck Lock Omen, drag it around, once you're done, check Lock Omen again. Recount (MiddleRight) Type "/recount config" (without quotes) and go to Window and uncheck Lock Window. Move it around, and lock it back up when you're done. You're free to re-enable the Report, File, Config icons if you want. 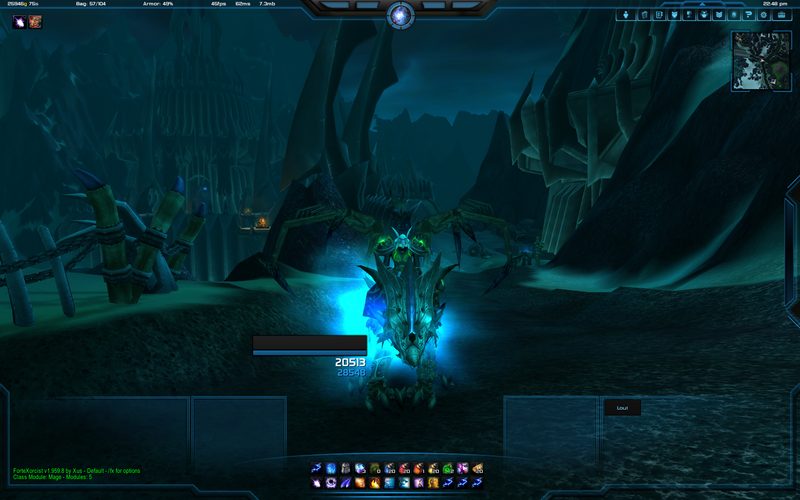 Raid (BottomRight): Type "/lui", go in Unitframes, and unlock them. Then move the lone raid frame with your name around. 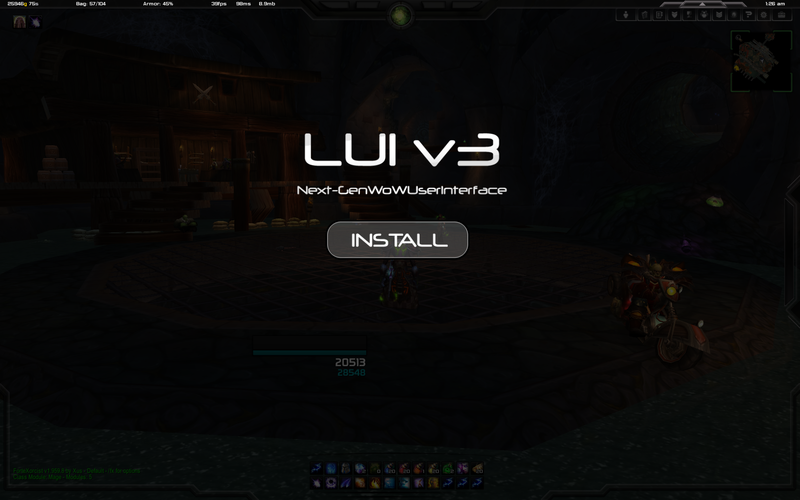 LUI is a World of Warcraft User Interface overhaul dedicated to replace the standard Blizzard UI in a way you cannot imagine. - Over 200 Textures that will make your WoW look better than ever before. - Option Panel with more than 3000 possibilities to make your UI unique. - (Optional) Rename your WTF and Interface folders to keep a backup of your old UI. 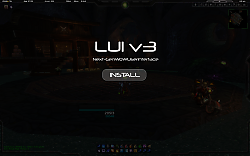 Please use the new and awesome LUI v3 Website if you have any questions or need support in any way regarding LUI. Note: If you pick Grid, Grid2 or Vuhdo make sure you go in the lui options, under Frames, then "Raid" and choose the appropriate name from the dropdown menu to have the texture correctly applied. Thanks to all of you for waiting so long! - New texture for the infotext bar at the top. This one is much much larger. There should be no differences for people using small resolutions (up to 1680x1050) and should come as a nice feature for people using larger ones (1920x1020) or even have dual/triple monitor setups. 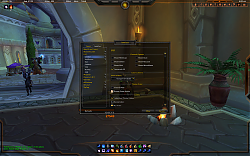 - You can now attach the Raid Texture Panel to Blizzard's default raid frames by using the dropdown menu. - Vengeance has been updated again. - Added Firelands Stuff to Raid Debuffs Icons, if you are using the LUI raid frames instead of Grid. - Fixed a few issues with Health and Power Updates. - If a boss has an Alternate Power, it will be displayed in place of the power bar. An example would be Onyxia and her Electrical Charge bar. - Fixed some issues with the Reputation and Experience bars. - Fixed issues when petframe was disabled. - Fixed the faction logo for BattleNet Friends. So now you can tell your friends are being traitors and will be marked with traitorous logos next to their opposite-faction characters. - Fixed a few comat issues. - Potentially fixed an error that would appear on extremely rare cases, and would end up disappearing after the ui is reloaded. Written as "potentially" due to the extremely rare and probably unreproducible nature of said error. - There was a screw up in the 3.5.1 release that caused the Interrupt and Merchant module (after following instructions) to still not work. This has been fixed. - Along the lines, the Merchant module has been rewritten to fixes any errors that caused its exclusion in the first place. - Some options of the Merchant module (such as the Item Quality) may have been reset as a result of this. - Added fix for Recount having huge font unless modified. You no longer need to modify Recount to have LUI's intended font size. - Fixed an issue with the unitframes when they were disabled. - The Player XP and Rep Bar should now come in front of the Health/Mana Text when mouse is hovered. - The Swing Timer and Vengeance Bars have been updated. - Fixed an issue related to fonts that appeared under certain situations. - Updated to 4.2's Combat Log Event to fix lag during combat. - Fixed an issue with the Friends infotext not displaying in 4.2. - There is a new button on the micromenu for the Encounter Journal, you can find it marked with a skull, next to the dungeon finder button. - Fixed an issue with the talent point reminder where it wasn't the intended color if you selected to use a white colored micromenu. - Remove the Merchant extra module from the basic package because it is not handled by anyone on the dev team, and it is causing quite a few errors to many people. - For LUI to load extra modules, you need to move the Extras.Xml file out of the modules folder (next to the LUI.xml), this was done to prevent your Extras.xml file from being overwritten if you were to update LUI. - For those who had a working Merchant module and want to continue using them, just move the Extras.xml file out of the modules folder. 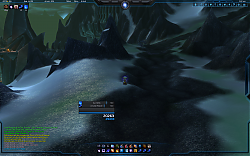 The Unitframes have been improved alot in terms of performance, and lots of bugs were fixed. Options have been added to Import and Export new unitframes setups, as well as being able to switch between various setups without much hassle! Import a layout, or exporting one, may or may not cause severe lag. Added an Alternative Power Bar, used by Blizzard for many raiding encounters. Arena Frames were added, which include frames for your opponents, their pets and their targets. BossTarget Frames added, but disabled by default. 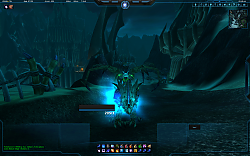 New Raid Frames have been added, in case you do not wish to use Grid or similar addons. Take note those are somewhat experimental for now. 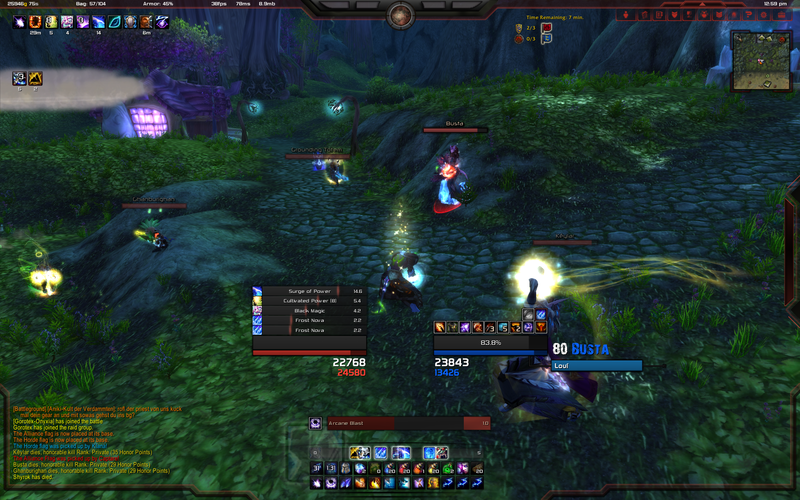 Unitframes now uses the same raid icons textures as the nameplates, because those are 20% cooler. DataText has been improved alot. Efficiency and performance went up to eleven. Now have two more info text bars. Along with having things in the Top Left and Top Right, you can now have datatexts in the Bottom left and Bottom Right. Removed most of the UI Reloads required when enabling / disabling things. Most option changes are now instantaneous. New entries: Currency, DualSpec and Instance Info datatexts. Added option to choose if you want infotext to work during combat or not. Added option to display Home or World Latency in the bar, or both. Added option to display your combined gold on the server, or just the current toon's gold. Left-Clicking on the Gold will now switch between server gold and toon gold. Instead of opening the bags. Fixed the infamous INVITE PENDING issue with the calendar...again. Blame Blizzard for having buggy API, not us. Fixed some other bugs that prevented the bags or bank from correctly updating. Added the Sort Button fix. Blizzard Errors not disabled by default anymore. This should reduce confusion by alot. Updated the ColorPicker to Ace3, no more Ace2 libraries! Updated and Improved the AutoAccept Invites function. Added the Merchant and Hix_Interrupter into the main UI. Mostly because of the cooked version in fact. Their original authors will still have to update them. - Fixed several minor problems. - Added FortExcorist BarColor/Spark Color Options. Will LUI be updated for 8.1? In the description it says that an extras folder will contain SPtimers to replace the defunct Forte addon. When I download the package I can see no such folder. I believe it's in the bartender options. Check to see if your stance bar is disabled or hidden. Your suspicions are mostly correct. I'm slightly ashamed to say I havent updated or even looked at my own site for stretch of times, but I do check on the LUI Discord server practically daily. It's really useful to keep up with multiple communities with ease. Will this addon be updated for Battle for Azeroth? Pleeeeeeeeeaaaaaaaaseeee with a cherry on top ! Hop into the Discord for the mod (link in description), and you can find an 8.0 compatible download in the pinned messages of the #general-lui3 channel. The author isn't as active on their site as they have been in the past (busy IRL I suspect), but I'm using this addon, with the LUI Core r834-alpha (via Twitch) dated December 5, 2017 and things are working just fine for me - no errors coming up. Definitely worth a try, IMHO, it's a great UI. Last edited by kittykatmax : 01-21-18 at 11:18 PM. How can I remove this orb? I don't seem to find any setting for it either. Would it be possible to add an option that would switch profiles when you switch to a different spec? For instance, you create a DPS profile & a healer profile. While playing your Shaman you switch from Elemental (DPS) to Restoration (Healer), the profile would automatically switch too. 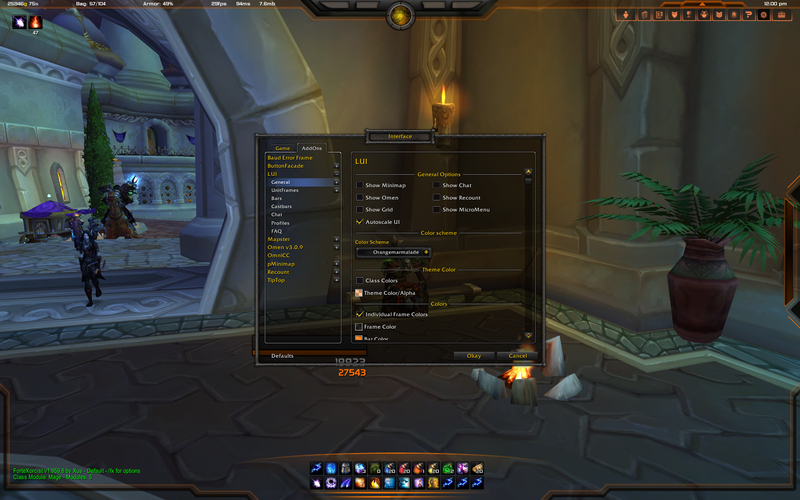 ElvUI has a switch spec feature under their Profiles which switches between profiles when you change between specs. I think that option would make it easily for players to switch between multiple UI layouts when they switch between specs. Last edited by canzjj : 07-17-17 at 07:05 PM. Getting this at random times trying to do things in the options. Locals: errorMessage = "Interface\AddOns\LUI\bugcatcher.lua:69: Usage: RawHook([object], method, [handler], [hookSecure]): Attempting to hook a non existing target"